At least one author must be subscriber/member of the journal at the time of submission of the manuscript. Manuscript will be accepted only after proper reviewing and on the advice of the editor(s). The management committee/editorial board assume no responsibility for the statement and opinions advanced by the author(s). Submission of research paper implies that it has not been previously published and it is not under consideration for publication elsewhere. Galley proof will not ordinarily be sent to the author(s), unless desired. Therefore author(s) is/are advised to prepare the manuscript with utmost care and strictly as per format of the journal. There will be no printing charges but nominal price of twenty- five reprints is compulsory after the receipt of invoice/acceptance letter. The management does not accept responsibility for any type of damage or loss of manuscript, keep a copy for your record. Manuscript must be original and written in English. Authors are requested fo follow the format for sending the manuscript. The original research paper/review articles are categorised separately in this journal. Full length paper should not exceed ten double space typed pages (A4 size) with wide margins on both sides, Whereas, short communication should not exceed by three pages. The first category should be divided into Abstract, Keywords (maximum 5 words in Italic), Introduction, Material and Methods, Results and Discussion, Acknowledgments (if any) and References. Paper in the second category should be in running form with references at the end in short form. Singh, S. P. (1997). Assessment of water quality by using bioindicator invertebrates. In : Ecodevelopment and Environment (ed. Shivesh P. Singh, Rashmi Singh and Ram Prakash) Vindra Publication, Jalgaon, pp. 187-192. U. S. Bagde, H. A. Upadhaye and R. S. Pandit (2007). Effect of cadmium toxicity on certain pathogenic sewage bacteria. Natl. J. Life Sci., 4(1) : 57-62. Wetzel, R. G. (1975). Limnology. W. B. Saunders. Co. Philadelphia, pp. 1-323. For publication, the manuscript in duplicate along with the CD disk (not in Floppy disk) should be submitted to Dr. Shivesh Pratap Singh, Chief Editor (NJLS), 34, Prabhat Vihar, Satna (M.P.) 485001 preferably by registered / Speed post. Further, the management does not take responsibility for any type of damage or loss of the manuscript. Paper should be sent via Associate Editors or Members of the Editorial Advisory Board along with their comments / suggestions (if any) for publication, however the Chief Editor may get it re-reviewed if he desire so. To share the responsibility of publication of papers, the author(s) is advised to become the member of the journal at the time of submission of the paper(s). To avoid delay, please send a letter of consent from the co-author(s) for the publication of the paper. The authors / co-authors are advised to send the reprint cost as soon as they receive the acceptance letter. 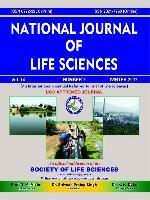 Payments are to be made through Bank draft only, in the name of "National Journal of Life Sciences" or "Society of Life Sciences", payable at any Nationalised Bank of Satna (M.P.) and not in the personal name of the editor(s). The Annual membership of the Journal is for the calendar year. This biannual journal is published in Summer (June) and Winter (December) for free circulation among its members. Individual subscribers are requested to please give their home address for safe delivery of the journal. Any change in address may please be notified at the earliest to the Managing Editor to avoid the non-receipt of the NJLS.